After nearly nine years of travel, NASA’s New Horizons probe finally awoke from its slumber on December 6 to face the destination of its 4.8 billion kilometre journey: Pluto. The engineers of NASA wanted the probe to awaken to the sound of a version of the song Where my heart will take me recorded especially for the occasion by the British tenor Russell Watson. On January 15, New Horizons will begin to observe the system of Pluto and its moons, culminating with a maximum approach on July 14 before continuing its journey into deep space. It will be the farthest object ever approached on a space mission, and its data will take four and a half hours to reach Earth. The meeting of New Horizons with Pluto will crown a mission that was born when its objective was still a planet with full rights. In 2006, with the probe already on the way to its destination, the International Astronomical Union (IAU) decided to solve a mess created a year earlier with the discovery of Eris, an object farther away from the Sun than Pluto and 27% larger than it, which was initially hailed as the tenth planet in the solar system. Facing the prospect of the discovery of new bodies in the same range of sizes, the IAU adopted a definition of planet that excluded Pluto. Another dwarf planet will also receive visits in the coming year. It is Ceres, the largest of the objects in the asteroid belt between Mars and Jupiter. 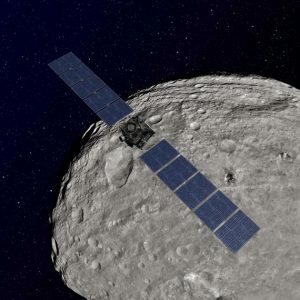 Arriving a few months ahead of New Horizons, in March 2015 the Dawn probe, also from NASA, will become the first artificial satellite of a dwarf planet, having previously visited the asteroid Vesta. The year 2015 will also offer us other missions in outer space. The Japanese probe Akatsuki is now revolving around the Sun after failing in its attempt in 2010 to be inserted into the orbit of Venus. In November, the device will once again closely approach the second planet, and engineers of the Japanese Space Agency JAXA are confident that this time it will be trapped by the gravity of Venus. Also from the east we will see a new mission to the moon. China’s Chang’e 4, which includes a robotic vehicle to explore the lunar surface, was initially built as a backup copy in case its predecessor, Chang’e 3, failed. As this achieved a successful landing, the replica parts were left with no purpose, but China will launch them this year to test new technologies to be applied in later missions that will try to return to Earth with lunar samples. Also in the new year the Russian Soyuz spacecraft bound for the International Space Station (ISS) will once again board private passengers who want and can afford a stay in orbit. After a break of six years since the voyage of the until now last space tourist, the founder of Cirque du Soleil Guy Laliberté, in 2015 the soprano Sarah Brightman will become the eighth paid occupant of the ISS, for a price of about 40 million euros. The British diva, who owes her fame to the world famous musical Phantom of the Opera, wants to become the first professional artist to sing in space. And while some missions are born, others die. After four years orbiting Mercury and discovering the volcanic past and other secrets of this planet, in March 2015 NASA’s MESSENGER probe will crash into the surface of the object closest to the sun. To celebrate the 10 years of the mission, those in charge are holding a contest, open until January 15, to name five craters on Mercury.